A museum dedicated to the single, though perhaps surprisingly complex topic of the Warsaw Uprising of 1944. The Museum covers that topic, down to the minutest detail, incorporating related topics relevant to the Uprising, and the application of the widest range of state-of-the-art display techniques, interactive elements and so on. This makes it easily one of the best museums in Poland (and beyond). A must-see when in Warsaw for sure! Note that the museum itself uses the somewhat more literary name "Warsaw Rising Museum", but they mean the same thing: the 1944 Uprising (but not the Ghetto Uprising of 1943 see also here). More background info: The Warsaw Uprising is a key defining element in Poland's national psyche. And the museum certainly conveys that – occasionally close to the point of palpable nationalism. And it's understandable: Poland maintained the highest level of resistance against the Nazis of any country occupied by them in World War II. The Polish Home Army AK ('Armia Krajowa') was the largest resistance organization anywhere in Europe. And after all the years of Nazi occupation, their biggest act of resistance of them all was launched in the form of the Warsaw Uprising in 1944. Though it ultimately ended tragically, the bravery of the effort is deserving of admiration. The exact details and circumstances involved are not altogether clear, however. This concerns in particular the role of the Soviets. By July 1944 the Red Army had pushed west as far as the outskirts of Warsaw and it was becoming clear that the Nazis were losing the war. That in itself gave the Polish resistance extra encouragement for their actions. On the other hand, the treatment of Polish resistance fighters by the Soviets was disturbing, to say the least. Members of the AK were even interned in the former Nazi concentration camp Majdanek near Lublin after it had been "liberated" by the Soviets. By July 1944 the situation had thus become as critical as it was uncertain. Encouragement was coming from the Polish government in exile in Great Britain and from the Allies to support the Red Army's push westwards. It was, however, more than doubtful whether the Soviets would in turn support the AK and its idea of a free and independent Poland. As the Red Army was already reaching the eastern districts of Warsaw on the other side of the River Wisla, the AK decided to act and launched its attack on the Nazi occupiers on 1 August 1944 – despite an insufficient supply of arms and ammunition, but with about 50,000 men and women. Helped by the element of surprise, they were initially quite successful and soon controlled various, though separate parts of Warsaw. The city's sewer system was cleverly and bravely used as a means of getting to different parts of the city that couldn't be reached at street level, not just for the purpose of distributing supplies but in particular for communication. But soon the Nazis fought back. Viciously. Dive-bombers and tanks were called in, additional reinforcements drafted, including Soviet deserters and POWs. District after district was retaken – accompanied by large-scale massacres of civilians, the use of civilians as "human shields" in front of German army vehicles, even the burning down of hospitals together with their patients and staff. After an agonizingly long battle of 63 days and some 20,000 AK fighters and about 200,000 civilians or more dead, the AK, or what remained of it, surrendered on 2 October. Some survivors also managed to flee the city – again through the sewers! And the horror was not over yet. Now the Nazis set about razing the city to the ground in retaliation, blowing up building after building that still remained standing. Allegedly an enraged Hitler had specifically given the order for this. All the while the Red Army did nothing to intervene or help the insurgents – apparently the Soviet authorities in fact even hindered Allied air support of the AK on several occasions. When the Soviets finally did march into Warsaw there was little more than a pile of rubble left of the city. All this left hard feelings towards the Soviets/Russians. And it made matters worse that after the war the memory of the Uprising was suppressed and censored under Soviet rule. The Soviets argued that the Uprising had been badly timed, was a strategically questionable move and that, anyway, the AK were some kind of right-wing organization that needed "dealing with". And indeed "dealt with" they were, Stalin-style. Many AK fighters disappeared in the gulags. So the suspicions the AK had held about the intentions of the Soviets were indeed borne out. Whether the Soviets could and should have militarily intervened to support the Uprising is a somewhat less straightforward matter but it remained an unasked but nevertheless brooding question during the Cold War era and is still an unresolved issue in Polish-Russian relations. Then came the fall of communism, in large parts thanks to the achievements of the Polish independent trade union movement Solidarnosc, which had itself taken some inspiration from the heroic resistance of the AK in the Uprising of 1944. After the end of the communist era, commemoration of the Uprising could eventually become more public and canonized. An "early" expression of this was the Warsaw Uprising Monument unveiled in 1989 at Plac Krasinskich, which is where some heavy fighting had taken place and from where survivors started their escape down a manhole into and through the sewer system (both dramatically depicted by the Monument). 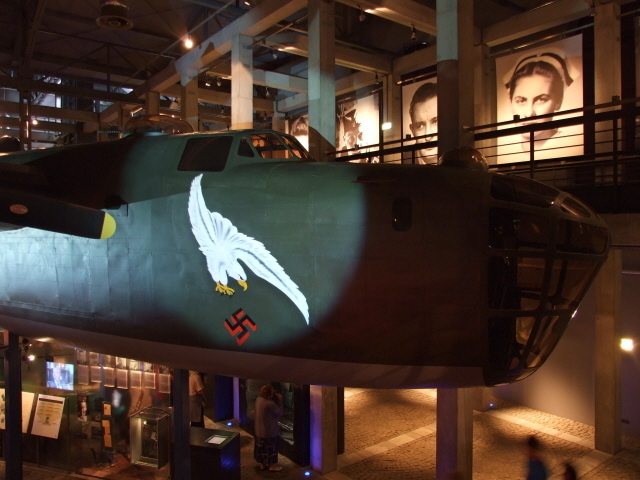 The Warsaw Uprising Museum took longer to come into existence, but it was finally opened just in time for the 60th anniversary of the Uprising in 2004. It has been further developed since then too and it's grown very popular with Poles and foreign visitors alike. Meanwhile the Warsaw Uprising Museum takes the unabashedly anti-communist (and anti-Soviet) approach that characterizes many such post-Cold-War commodifications of the memory of communist rule; cf. for instance also Budapest's House of Terror Museum. The building that the museum is (for the most part) housed in is an interesting structure in itself (but there are some open-air parts too). It used to be a power station for Warsaw's tram system. Much of the outer facade has been retained in the conversion of the building. It's a quite beautiful brick exterior typical of the time it was originally built in – the early years of the 20th century. A gem of industrial architecture of that era. Inside, parts of the original building's contents have been retained too, namely parts of the boilers, which now form a curious contrast to the museum's primary contents. These are thematically structured and include sections on Nazi rule of Poland in World War II, the subsequent communist era, sections about communication in the underground – including a working printing press, where you can pick up flyers. Even the surprisingly elaborate underground postal system gets detailed coverage. A unique feature of the museum is its "heart" – a structure that goes up all the way from the basement to the top – and it emits sounds, when you get your ear very close to it, partly heartbeat-like throbbing, partly music and battle soundscapes … very unusual and strangely gripping. Of the more conventional artefacts on display the prime specimen literally towering over everything else is the reconstructed B-24 plane whose sheer size almost fills the central hall from edge to edge. It's kind-of suspended in mid air, but from the upstairs gallery you can get face-to-face with the plane, as it were. Planes of this type were used by the Allies in support missions to drop weapons and other supplies for the insurgents. Another "highlight" of sorts is the reconstructed section of sewers – here you can crouch down and wriggle through a stretch of narrow brick sewers, some 30 yards long, complete with the sound of running water in the background piped in via loudspeakers … but thankfully without the smells of real sewage – that would probably have taken the lifelike-ness a little too far. The sewers wind and turn so that you get an impression of how easy it must have been to get lost in them, especially in the dark. This mock-up installation, however, is sufficiently lit. Still, it's not for the claustrophobic, but very impressive. Visitors are not forced to go through the sewer mock-up on their circuit through the museum. You can skip it, if you want, and walk a different course. The sewer section is certainly a key element of the museum, as the use of the sewer system in the Uprising was as ingenious as it was the stuff of legendary, if tragic, heroism. For instance, it was depicted to great effect in Andrzej Wajda's 1956 film "Kanal", which further helped ingraining this part of the story in Poland's modern folklore. At the museum, you can now partly re-enact this story in comfort, as it were. Also remarkable: a very clever photo slides installation provides a shocking impression of the destruction of Warsaw by the Nazis in retaliation after the Uprising was crushed: slides of pre-war images of various parts of Warsaw blend and alternate with shots taken from the same spot after the city's destruction. This really brings home the horrifying scale of the devastation. Next to the remaining boilers of the former power station, and only partly shielded from the rest of the museum (thus retaining an open hall atmosphere) is a central cinema utilizing quite a huge screen. The material played on the screen is in Polish with English subtitles. Explanatory texts at the more stationary objects and installations are also consistently in Polish and English. The quality of the translations is at times a little shaky (especially with regard to tenses), but overall decent enough to provide the non-Polish-speaking visitor with sufficient information. A rather odd part of the museum is a kind of tower on top of the building. It has a somewhat twisted shape indented to resemble ruins of the destroyed city – but its main function is that it displays the Uprising symbol. 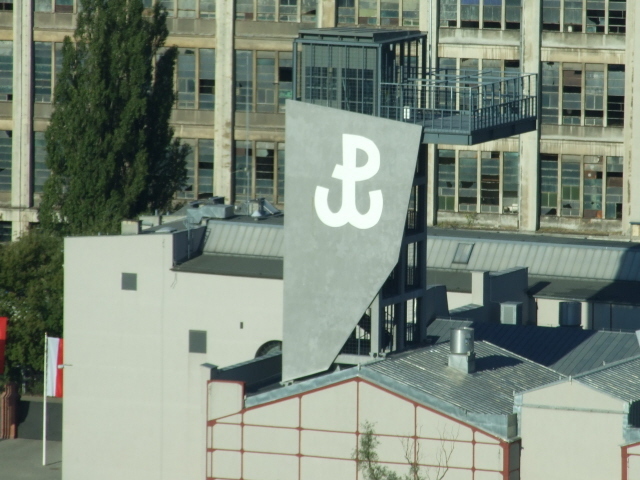 Thus the museum's "logo" of sorts can be seen from far away. For the museum's visitors it provides an observation platform at the top. 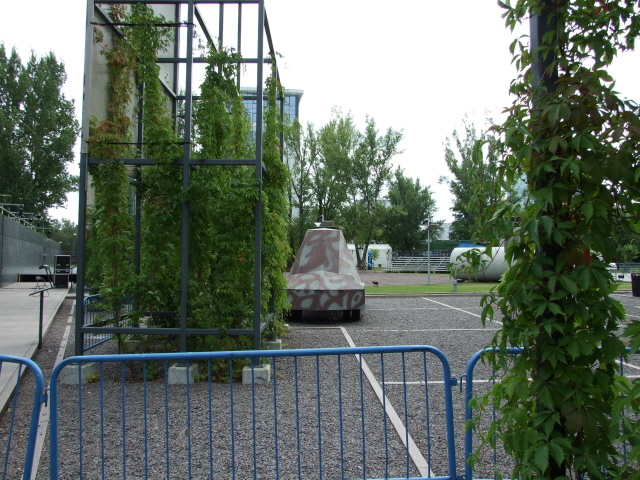 From there you can see some of the outside parts of the museum from a bird's eye perspective: these include a few more objects, such as a mock-up of the "Kubus" – a makeshift armoured vehicle or tank that the insurgents built with much ingenuity and improvisation to counter the Germans' "proper" tanks and guns. 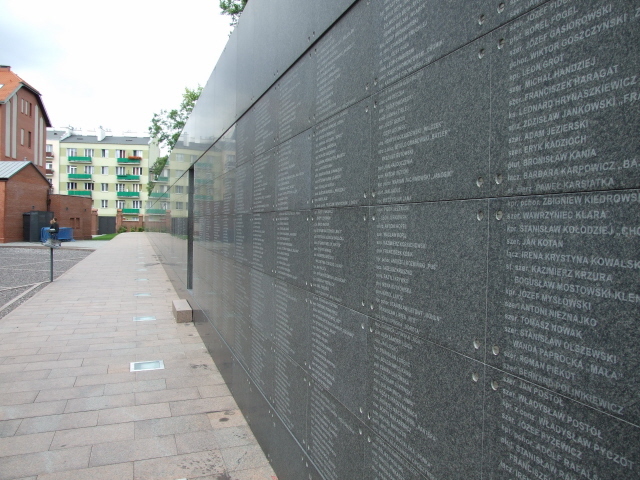 Also open-air is a "memory wall" (or 'wall of remembrance') with thousands of names of fighters who lost their lives in the Uprising – this is actually a work in progress, because more names continue to become known from the evaluation of further documents that are still being discovered. Behind the wall of names is an artistic zone, so to speak, where you can see large-scale paintings, some of a very peculiar nature. 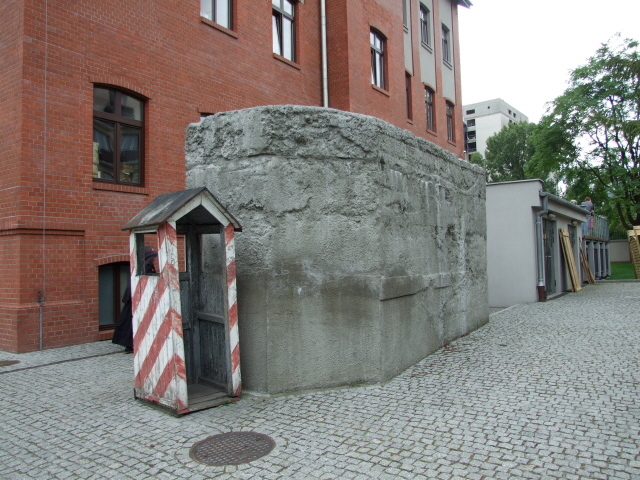 Hidden behind a side building is a small bunker and guardhouse of the sort that would have been used at the time of the Warsaw Uprising – the hidden location of these large objects and the scarcity of accompanying information make them seem a bit out of keeping with the rest of the museum, though. By the entrance to the main section of the museum, as well as in a separate little building outside, there are souvenir and bookshops selling a wide range of publications. There isn't that much reading material on sale in languages other than Polish, however. Finally, it should be noted that the Museum enjoys great support from the Polish people, and it can get quite busy at times. When I visited in early August 2008, i.e. at a time around the 64th anniversary of the Uprising, it was particularly busy, with school groups forming a large proportion of visitors. This made for a really hustling and bustling atmosphere, which was perhaps slightly at odds with the purpose of the museum as a place of remembrance too. But, on the other hand, you can see it as quite in line with the overall "young" and "modern" approach of the museum – with its audio-visual, multimedia interactive and hands-on elements. It also relies a lot on displays of "war toys", i.e. goes beyond the mere goal of giving information. It thus wouldn't surprise me in the slightest if this museum manages to impress children at least as much as it does adults. In other words: it may make for a decent "family" outing too. In fact there is a section specifically aimed at younger visitors. This even includes a replica of the "Little Insurgent" monument in the Old Town (see Warsaw Uprising Monument). All in all: this is easily the top attraction for the dark tourist in Warsaw – and also ranks high in terms of tourism in general (It's currently second in the ranking on Tripadvisor, for instance). This may have the side effect that it can get really crowded and noisy, but it really is a must-see when in the city. Recommended! Location: just west of the city centre, a bit less than a mile and a half (2 km) from Warsaw's dominating landmark of the Palac Kultury i Nauki. 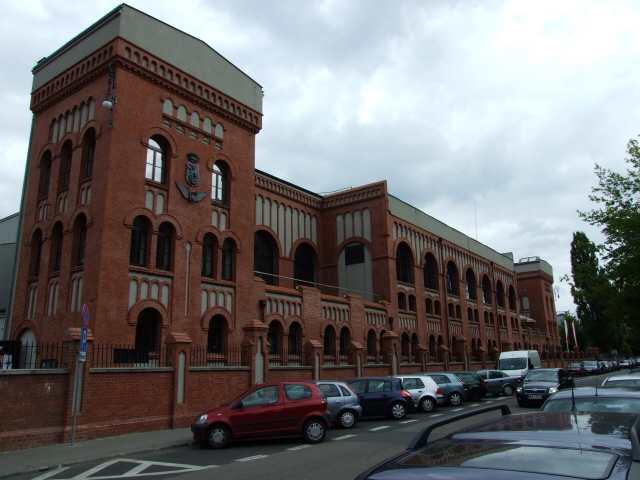 The museum's official address is 79 Grzybowska Street, but most of its front facade faces Towarowa boulevard, while the entrance to the museum is at the back of the building at 28 ul. Przyokopowa. Access and costs: not so complicated; not too expensive. Details: it's easy to get here on public transport: trams run straight past the building along Towarowa boulevard. From the tram stop it's just a couple of minutes walk round the back of the building to where the entrance is on ul. Przyokopowa. You can take e.g. tram lines 20, 22, 24, 32 or 1; buses 151 and 155 take you there too. 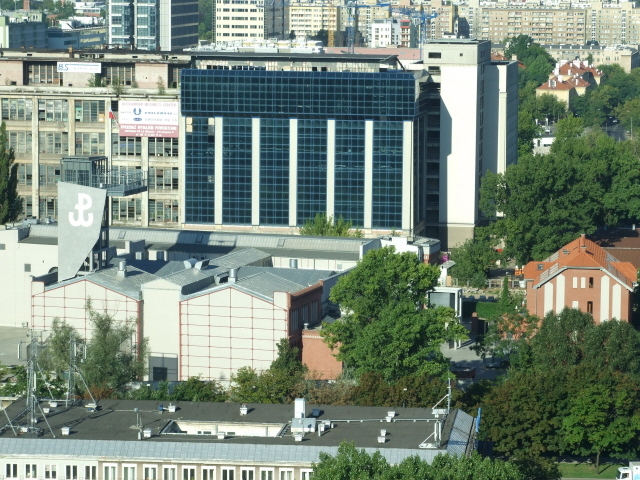 From Warsaw's main central business district (where many hotels are located) it is also easily walkable. Opening times: Mondays, Wednesdays, Fridays 8 a.m. to 6 p.m., Thursdays open late to 8 p.m.(!). At weekends and during holiday periods open only from 10 a.m., closed on Tuesdays. Admission: 18 PLN (concession: 14 PLN). Free on Sundays! Guided tours are available in a range of languages, including English (100 PLN per guide). Organized groups have to make a reservation in advance (through the museum's website: www.1944.pl). Audio-guides are available too, in an impressively wide range of 19 (!) different languages, and cost 10 PLN etxtra. Time required: more than the uninitiated visitor may be prepared to estimate. Unfortunately I only had a good two hours when I visited in August 2008, and had to hurry through some parts of the museum. I could have spent twice that time there easily. If you want to really see it all, read all the info available and watch all the films, then you could probably set aside the best part of a whole day for this. By location, the nearest other dark site in this part of Warsaw is the Korczak orphanage, which is just round the corner: walk up ul. Towarowa one block and then turn left into ul. Jaktorowska, after less than 200 yards the orphanage is on the right-hand side, slightly set back from the road. Thematically, the Warsaw Uprising Monument & Insurgents Museum near the Old Town is an obvious choice for following up a visit to the Uprising Museum. To get there, it's easiest to take the No. 32 tram northbound towards the Old Town; get off on al. Solidarnosci just after passing the Archaeological Museum and walk up e.g. Leona Schillera or ul. Dluga to get to Plac Krasinskich. Combinations with non-dark destinations: in general see Warsaw – nothing of mainstream tourist interest is really close by, but the trams outside the museum give easy access to both the Old Town by tram No. 32 (as for the Warsaw Uprising Monument), while tram No. 22 takes you to the southern end of central Warsaw, past the main railway station (Warszawa Centralna) and the landmark tower of the Palac Kultury i Nauki.